One member of the group should read aloud Luke 4: 16-19 in the King James edition of the Bible; another member should read the same text aloud from the New Revised Standard Version. Discuss: What is the New Revised Standard Version and what is its relationship to the King James translation? Does it matter what translation we use? What differences did you hear between the two versions? Why would religious conservatives want to cut out certain passages from the Bible, as in the Conservative Bible Project? Read about that here. The famous 20th century Christian theologian, Karl Barth, used to say that he would preach “With the Bible in one hand and the newspaper in another.” But Karl Barth lived before the age of the Internet. Today what is reported as “news” can be very slanted. It is important that we as Christians look and see for ourselves what is happening in our communities. This week, what did you learn as you observed your own community? 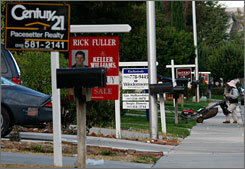 Are there more foreclosure signs? Abandoned properties? Were there jobs available in your neighborhood? What did you find out they pay? Were there lines to apply for jobs? Share any observations you made this week or you have made in the last year or more. The entire script is available here. The American Values Network, a not-for-profit that helped sponsor this video, has a biblical guide to scripture and the U.S. budget. What did you think of the “Tea Party Sermon on the Mall” versus the real words of the Sermon on the Mount? Does it make a difference to read your Bible while looking at your community and new media? Is this a new way of reading for you? Why or why not? What questions did you come away with? Continue to read the Gospel of Mark. In addition, read Chapter 2 of #OccupytheBible on Temptation.